Friday February 9th 1894 It was a snowy bad day. I ironed in the forenoon. Edith was in for her dinner. I was writing most of the afternoon and made some calculations about my carpets. The Mains have rented the house and will take some of mine. 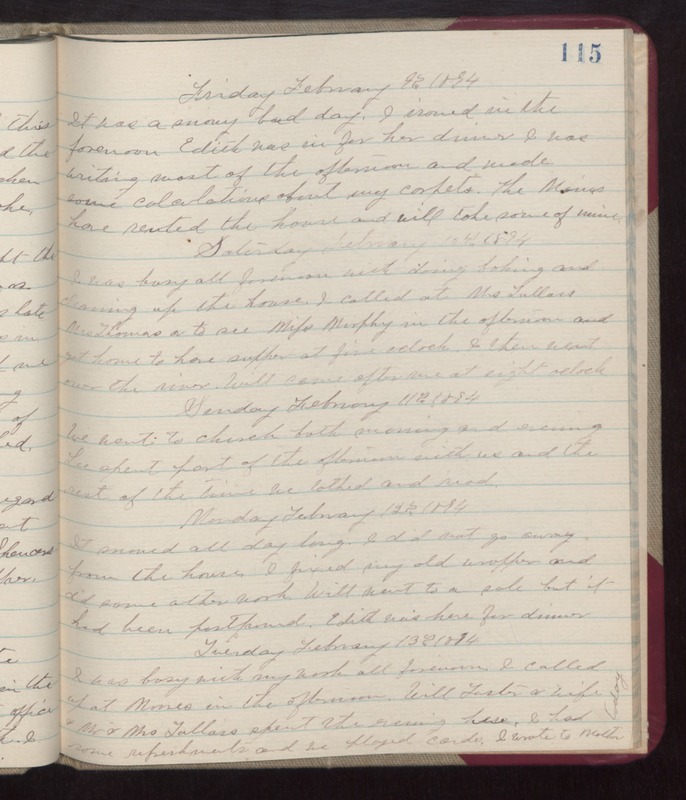 Saturday February 10th 1894 I was busy all forenoon with doing baking and cleaning up the house. I called at Mrs Tallars, Mrs Thomas & to see Miss Murphy in the afternoon and got home to have supper at five oclock. I then went over the river. Will came after me at eight oclock. Sunday February 11th 1894 We went to church both morning and evening. Lee spent part of the afternoon with us and the rest of the time we talked and read. Monday February 12th 1894 It snowed all day long. I did not go away from the house. I fixed my old wrapped and did some other work. Will went to a sale but it had been postponed. Edith was here for dinner. Tuesday February 13th 1894 I was busy with my work all forenoon. I called up at [Morres?, Munes?] in the afternoon. Will Foster & wife, Mr & Mrs Tallars spent the evening here. I had some refreshments and we played cards. I wrote to Mother today.